In response to what many in Sierra Leone regard as an unfair attack on the integrity of a senior Judge in Freetown by one of the country’s newspapers – Awareness Times, the Bar Association has strongly condemned what it calls a publication that ‘has the propensity to fuel public hatred and discontent and bring disrepute to the judiciary and the judge concerned’. 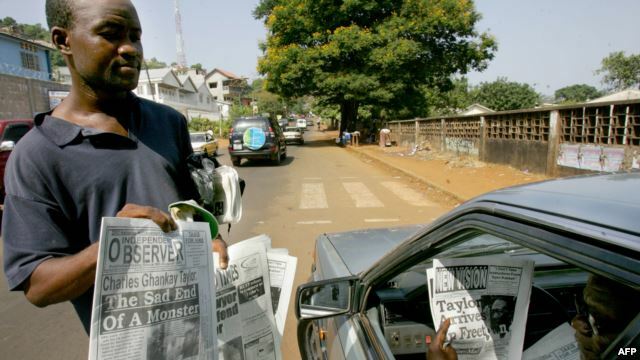 But the editor of the Awareness Times argues that its publication, which follows the court ruling by Justice Alan Halloway, ordering the country’s media watchdog – the IMC, to reduce the fine levied against the Independent Observer for breach of media standards, was in the public interest. Awareness Times accuses the Judge of lacking in integrity and unfit to practice, citing a previous unsuccessful corruption indictment of Judge Halloway by the Anti-Corruption Commission. But fact remains that, Judge Halloway was, and has never been convicted of any offence. This calls into question, the fierce attack being waged by Awareness Times against Justice Halloway. Critics say that the war against Judge Halloway is being prosecuted by Awareness Times in support of its editor – a former executive assistant to the president, on whose behalf the Independent Media Commission had imposed a hefty Sixteen Million Leones fine against the editor of the Independent Observer, for wrongful reporting. By calling upon the media commission to reduce that fine on the Independent Observer, Judge Halloway is now facing the wrath of the Awareness Times. Hardly fair on the Judge, many are now arguing. But the country’s Bar Association which represents the backbone of Sierra Leone’s Judiciary says that it will not stand for any unfair attack on the integrity of any of its members. “The Sierra Leone Bar Association (hereinafter called the SLBA), wishes to draw the attention of the general public to the series of publications on social and print media, touching and concerning the Judiciary of Sierra Leone and members of the Superior Courts of Judicature in the last couple of weeks. “The SLBA notes in particular, the publication of Monday 22nd June 2015, by the Awareness Times Newspaper on its front page, captioned: ‘A ROGUE JUDICIARY CATALYSED CIVIL WAR’ with the photo of the learned Justice Allan B. Halloway J. who was therein described as “……….. needs to be of high moral rectitude” and who in the body of the article was addressed as “Halloway”. “The SLBA wishes to inform the general public and in particular, the publisher and the management of Awareness Times newspaper, that the judiciary of Sierra Leone holds a very sacred and important part of the Government of Sierra Leone and ought to be treated as a distinct and honourable arm of Government and its personnel, especially Justices of the Superior Courts of Judicature demand respect from members of the public, including publishers and publishing houses. “Let it be known that We SLBA, abhor the content of the front page headline of the Awareness Times newspaper publication of 22nd June 2015. “The Bar Association is gravely concerned over the use of such disparaging remarks likely to bring a feeling of disrepute to the Judiciary of Sierra Leone and the Honourable Justice A.B. Halloway J. “It is better said that such publication has the propensity to fuel public hatred and discontent and it brings disrepute to the Judiciary and the Judge concerned. Will this statement by the SLBA, bring an end to the unwarranted attack on Justice Halloway’s integrity by the Awareness Times? It seems rather unlikely. The editor’s response to the Bar Association’s statement has been one of defiance. No need for restricting vehicle and people’s movement by the police. Doing so would be illegal and unconstitutional and would further indicate that the SLP is incompetent, incapable and inefficient. What is the role of the police in any state if not to provide ample round-the-clock security for people’s lives and properties. So I believe that unless the Sierra Leone Police want to demonstrate incompetence and inefficiency, then they would go ahead with this cowardly act. Awareness Newspaper has committed a crime against His Honour Justice Halloway, this should stop. Journalists who disregard the law should be brought to justice, as no one is above the law – not even the President of the country. A country without the rule of law is no country in the eyes of the world. In my view, Awareness Times has committed a libel. I have said it many a time on social media that Sylvia Blyden is not a journalist. She lacks journalistic etiquette, education, and professionalism. Her trashy tabloid for which she is the ‘editor’ is like a loaded gun in the hands of a derange person, like the white supremacist who shot 9 people in a church. The ‘editor’ of this trashy tabloid was recently sacked from her job at State House, and she is desperately trying hard to get her job back. If she is not comparing Victor ‘tif man’ Foh to Mandela, she is parading around as a mouthpiece of EBK. She uses the trash she calls a newspaper to attack decent people with morality and character she could only imagine. To me she is a frustrated individual that is looking for some purpose in her life or to make herself relevant, after she failed abysmally in her so-called medical doctor career, if she ever had one, that is.